In 1997, Christopher Bailey began repurposing industrial elements into furniture in San Francisco. In 2000, the self-taught artist brought his business back east. At his studio in Panama City Beach, Fla., Bailey uses steel, cast iron, rivets,reclaimed wood (some from bowling alley floors) and mechanical elements (vintage gears and wheels) to create his bold, functional pieces for his company, Industrial-Chic. Take his 48-inch-round wine tasting table ($1,495 & shown above). Originally, it was a textile mill cart, used to transports spools of thread around the factory floor. Bailey gave the old cart new life. 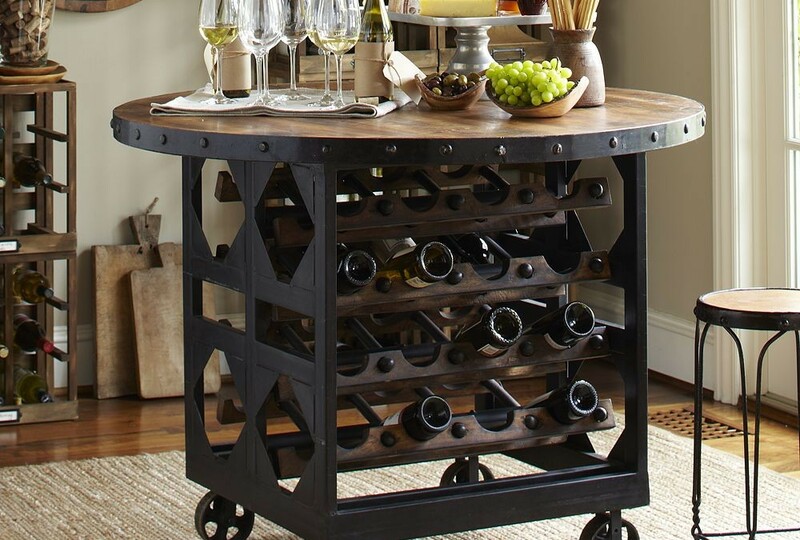 The textured table, made with steel and hardwood, can display 32 bottles of wine. Add bar stools for seating. One of Bailey’s newest designs is an adjustable table (below), which easily can convert from dining to bar height. Prices for his custom, iron-based tables range from $795 to $3,895, depending on size.